There are few fictional worlds as rich and complicated as the one created by J.K. Rowling. 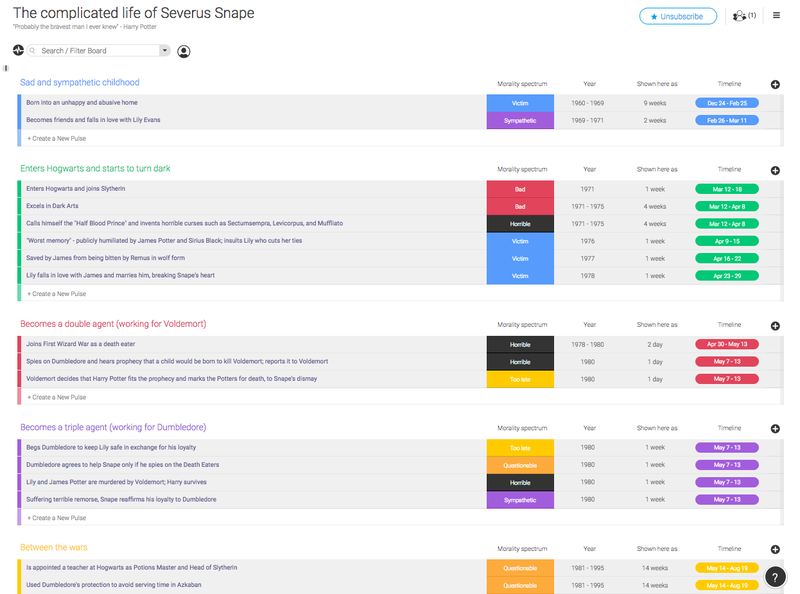 We thought it would be fun to create some boards organizing just some aspects of the wonderful Harry Potter universe. Why is Voldemort so indestructible? The books reveal that it’s because he has concealed fragments of his soul in various physical objects outside his body, otherwise known as Horcruxes. To create each Horcrux, Voldemort first had to commit a deliberate act of of murder, damaging his own soul, and then cast a spell ripping a damaged fragment of his soul from his body and encasing it in an object. The Horcruxes were very durable, requiring rare magic and processes to destroy them. 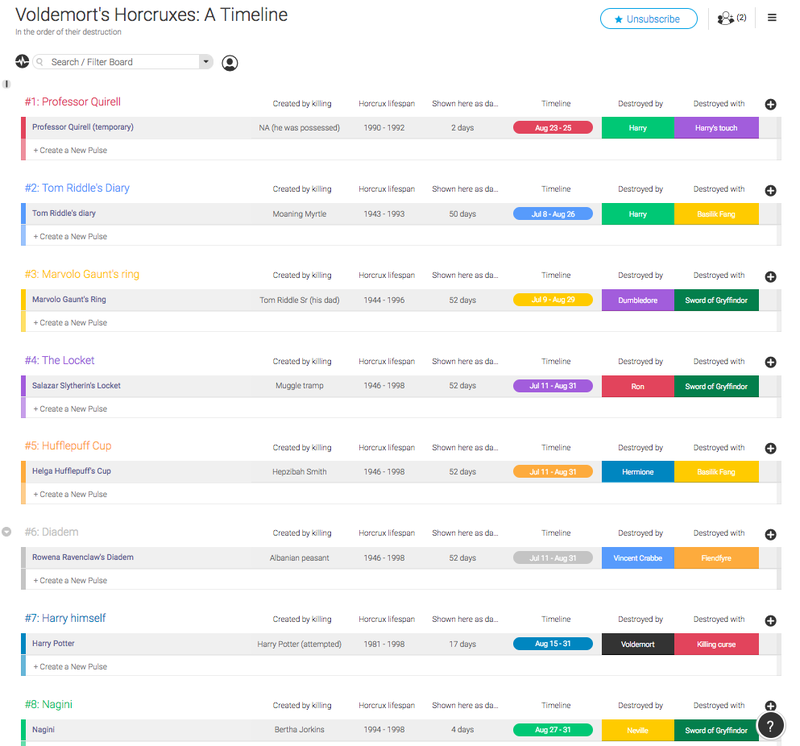 We created a board detailing all of Voldemort’s Horcruxes: how and when they were created, how long they existed for, who destroyed them, and with what. Every parent knows what a hassle (and financial burden) back-to-school shopping can be. 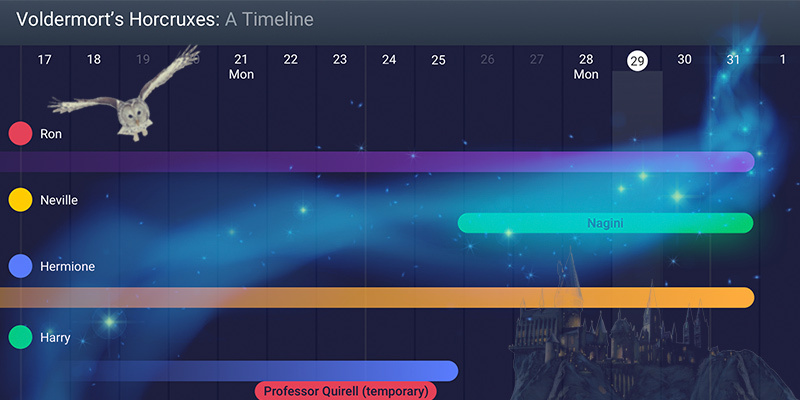 Well, after creating this board, let’s just say you should be glad your kid doesn’t go to Hogwarts. 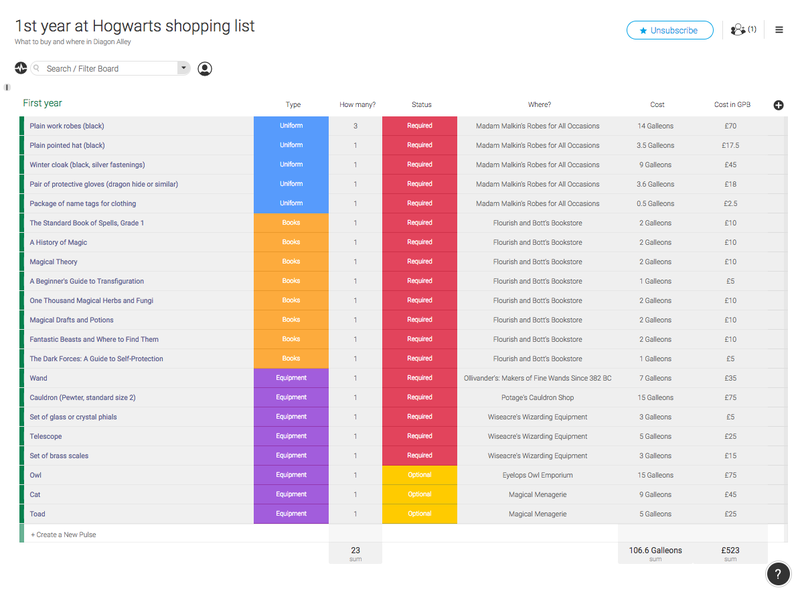 We created a list of all the materials a first-year student at Hogwarts requires, how much it costs, and where to buy it in Diagon Alley. Finally, as indicated by J.K. Rowling’s exchange rate in 2010 that one Galleon equals about five pounds, we calculated with the numbers column how much the list would cost in Muggle money. Remember how intense the Triwizard Tournament was in Harry Potter and the Goblet of Fire? This board outlines the events and outcome of the most epic sporting event in history. Poor Cedric. We saved the best for last 🙂 There are few characters in all of literature as tortured and controversial as Severus Snape. Was he good? Evil? Admirable? Pathetic? Quite possibly all the above. We mapped out the events of his life so that you can see in a glance just how complicated of a man he really was. 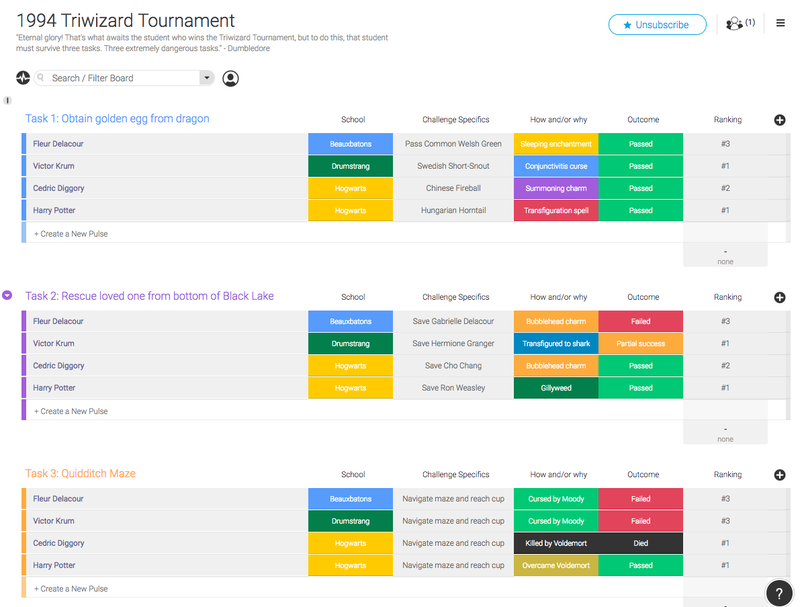 Unfortunately we couldn’t fit it all into a screenshot; so get the entire board, you can sign up below. Gimme these Harry Potter boards! PS: What if Game of Thrones used monday.com?